Today I want to share my weight loss journey with you. It’s a journey that I hope is not at it’s end, though I’ve been on a plateau now for quite a while. My goal here is to inspire people who are struggling – whether to start moving toward a healthier weight, or lifestyle, or to support the journey you’ve already begun. I didn’t realize that my slow, steady weight loss after my second (and last) child could be an inspiration to some. When I was collaborating with The Motherhood Project on a Working Moms Interview, her questions made me realize I do have some worthy tips to share from my busy life! Looking back, I was surprised to realize I lost 50 pounds – for real! And without any really serious effort on my part. I am not a doctor, dietitian or exercise guru. I’m a regular mom who has no time, and no extra money to spend on supplements, gym memberships and diet plans. And I’m okay with that! Read on to learn about the small changes I made in my life, and how they helped me get where I am today. When I was at the end of my first pregnancy I topped out at 200 lbs. I’m only 5’2″, so that’s a lot of weight on my short frame. Looking back on the photos now I have a hard time believing I was ever that heavy. But I was – and after Emma was born I didn’t lose any weight. Okay, well maybe 10 lbs, I mean I did birth out a baby, but nothing significant. And then it was winter, and I didn’t really like having a baby because she cried non stop and I never slept and she nursed every 10 minutes and, frankly, I hated it. 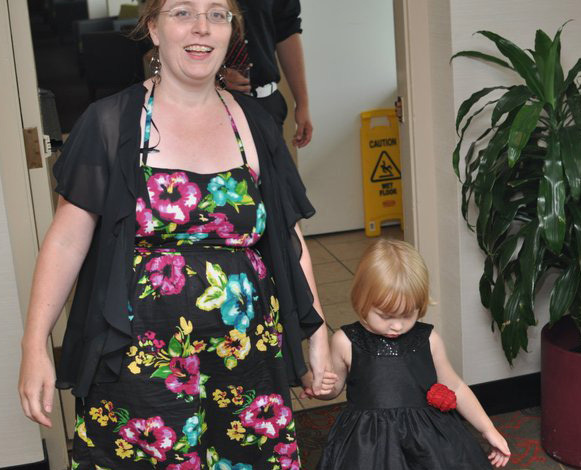 I stayed heavy pretty much until I got pregnant with my second baby 2 years later. I should probably say that I gained about 30 lbs from my “single life” after I got together with Patrick. We ate a lot of fast food, and didn’t do much activity – in fact, because I moved in with him, I stopped walking to work (too far now) and lost the bit of activity I was doing there. I did join a gym for a bit, but I don’t like gyms so that didn’t do me much good. I should say that in both my pregnancies I had terrible morning sickness – and it was not restrained to mornings! I still don’t really understand how I gained so much weight in my first round growing a baby. I guess I really only gained about 35 or 40 lbs, but it really hung on. The second time around it was totally different. I was not actively trying to lose weight. I was all day nauseous – plus working full time – so just not eating as much due to not really being hungry. And I was going home to my 2 year old who was still a handful with crying a lot and being a super picky eater. I actually had a lot of anxiety about going home after work (because I didn’t want to listen to Emma cry at bedtime and fight at dinner time) so that also suppressed my appetite. But we soldier on, don’t we? I think I gained maybe 20 lbs (after I stopped losing weight) during my pregnancy with Rose. 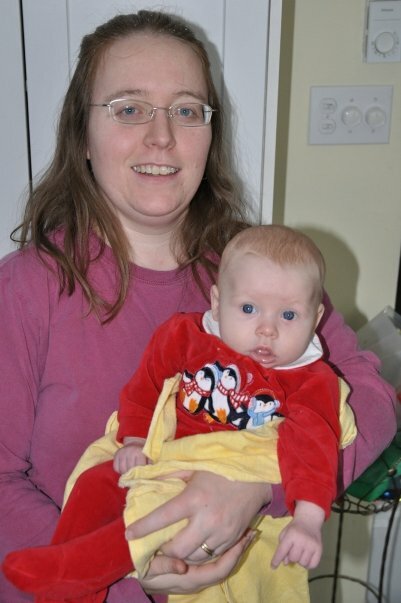 When I gave birth to her I was about 180 lbs, if I remember correctly. Rose was the total opposite of Emma. She slept no problem, was awake without crying, and liked to just look around and be alert. I had never experienced that before and it allowed me to be much more relaxed this time around. I also was able to make time for myself. Taking Rose for a walk was pleasant. She would sleep, or just look around. (Emma would cry until she fell asleep, then wake up the minute you stopped moving the stroller, or yourself.) I could go out and do more with a baby who was happy! When I headed back to work I snagged a city parking lot space that’s about 6 blocks from where I work. That’s a good 7 minute walk each way. It sounds silly, but adding that tiny bit of walking to my day made me feel good. Plus my shifts at work had minor adjustments as well. We stay open one hour less in the evenings now. That (at that time) meant I could have dinner with everyone on my later shift nights. Now our schedule is extra wild and crazy, but we still get one or two family dinners in a week. I tried (and still do try) to stick with the healthier choices in my diet. Really, all I did was replace a granola bar a day with a piece of fruit or vegetables. I’ll occasionally have a carb bar of some sort, but much less often. And the big thing I do now (and started after Rose was born) is to EAT LESS FOOD. I know that seems ridiculous, but if I put less food on my plate, I often realize I am full after that much and don’t need more. If I take more food I will eat it, mindlessly, thinking I should clear my plate. And if I really want, or need, more, I just go get it. I’m not depriving myself – just learning my full signals. The last thing I do now that I didn’t before, is take a ballet class. I don’t feel like I’m losing any weight from that, but I am very much enjoying learning ballet, and having adult time with other lovely people. This is my “me time” during the week – and it helps keep my stress levels down. I’m sure the 90 minutes of activity does help keep me healthy in other ways besides weight loss! I don’t go to a gym. I tried that, and I had no motivation – plus it can be crazy expensive. Instead I try to take a 20 minute walk twice a week on my lunch break. It’s great because it gets me out of the store, and I get some downtime with my music – which is the real reason I love going for walks! I don’t do shakes, exercise videos, diet pills or supplements, or any of those “fad” type weight loss tricks. I just use common sense. My friend Jill talks a lot about Intuitive Eating in her Food Freedom/Body Love method, and I’ve come to realize that’s what I do. I eat when I’m hungry, (try to) stop when I’m full, and I don’t exclude foods I like, but may not be a healthy choice. Everything in moderation. I don’t deprive myself of anything. If Patrick opens a bag of chips, I eat some. Sometimes I eat a lot of them. Often I try to restrain myself – I always know when I’ve had enough, but I don’t always have the willpower to stop eating them. We also eat a lot of take out, or quick freezer meals. Again, I try to make healthy choices, but ordering a pizza is so easy! I try doing portion control with pizza, but it rarely works. 4 slices is a serving, right? I don’t drink sugary drinks (unless you count wine.) When we go out, if I’m not having wine, I’ll just have water. We rarely drink juice here, and pop is a treat. Okay, that’s a lie – Emma doesn’t like pop, and Rose gets it rarely. Patrick drinks it often, but I’m not his mom. I don’t have any most of the time. Though once in a while a Pepsi with some rum is pretty darn tasty! So drink lots of water and stay away from sugary drinks (including juice, though it’s how I sometimes get Emma a fruit serving during the day) and you’ll save some calories! It still floors me that I can call this post “How I Lost 50 Pounds” because it doesn’t seem right. Did I really shed 50 pounds without “trying”? I guess I did. And that makes me think anyone can do it. You just have to be ready to make a few small changes – in your lifestyle and your mindset. Weight loss is a slow process. Or it should be, if you are hoping to stay on track and keep it off. It’s strange for me to look back and realize all these tiny things I did – knowing they were good for me – actually worked. I shed a lot of weight and I didn’t really try to do it. So if these little changes worked for me, they can work for you too. If you’re just starting to think you’d like to work towards a healthier lifestyle, just decide on one of my little tricks. Do it until it becomes a habit – a regular part of your lifestyle – and then add in another one. My start was as easy as thinking “I don’t need to pay for a drink at a restaurant – I’ll just have water.” And it stuck – more because water is free and a pop or juice is not, than for any healthy reasons. But hey, you have to start somewhere, right? I would love to hear if you have small lifestyle changes you’ve made over time that have helped you lose weight, or just feel healthier. Please share those stories to help inspire me, and anyone else who’s on the same path. Oh! I almost forgot! I have another post I created about getting some exercise during your busy days. Make sure you go read it – it’s another set of real life tips that worked for me. It’s nice to hear that the “easy” ideas can work, isn’t it? I’m so glad to hear you’ve lost some weight too! Thanks Briony. It’s a great story to reflect back on now. It wouldn’t have worked if I had to make any real changes. I think that’s one of the keys to success. Thanks Eva! It’s been a long road, but not especially hard.